Bloody Thursday memorial at the ULWU office, Mason & Beach streets, San Francisco, 2009. Photo by Liz Allardyce. 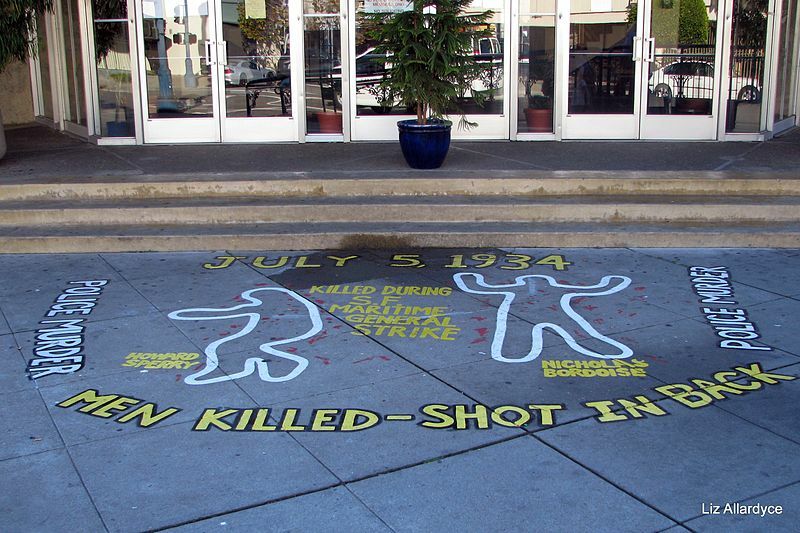 On that day, in the midst of a long-term strike, two men were shot and killed by police as the police attempted to break up strike barricades that prevented the flow of goods to and from the port via the Embarcadero. Later that night, the strikers were forced to withdraw by the use of the California National Guard, but sympathy generated by the funerals of the two dead men changed the general tenor in San Francisco, and soon the International Longshoremen’s Association (now the International Longshore and Warehouse Union) was joined in a general strike by dozens of area unions. Although the ultimate settling of the series of strikes all up and down the West Coast did not grant unions every concession they sought, and though there was violence well beyond Bloody Thursday, it is often credited as being a turning point that helped to establish the power of labor. When I was growing up, my parents both belonged to the National Education Association, but to me it was indistinguishable from the many other professional organizations to which they belonged. It was a time when what unions had accomplished in the previous decades was taken for granted, and I was hardly aware that my parents were union members. No more. Unions are now under attack again in our country, and those of us who rely on them to assure our minimally fair treatment and compensation have cause to be worried. It is also one of those things that makes my jaw drop with disbelief that anyone who is a working person today can speak out against unions. Not that unions are perfect—they are subject to the same kind of corruption and mis-management as any other kind of human organization—but they are indeed a prime support of the so-called “freedom” that we celebrate, unless, that is, we only celebrate the freedom of the wealthy. More and more, it seems that large segments of our population somehow believe that wealth is justification for anything. I am stumped by this phenomenon, but I also believe it is related to the positive psychology movement that indicates we have a “choice” about everything that happens to us. And it is in this way that I believe that Oprah, who is a big Obama supporter, nonetheless undermines reality-based politics and policies with her incessant, wealthy-woman insistence on the legitimacy of positive psychology. I guess she needs to believe that she deserves all of her wealth and that the rest of us could have it, too, if we only believed in ourselves. She retains one foot in the real-person world based on her modest beginnings, and therefore she can show some sympathy to others, but still… she’s forgotten too much. She nodded and turned back to filling out the form, gripping the pen and bearing down hard. Truly, though, I don’t know. I had parents and a brother who understood this without having had diabetes, and grandparents who did, too. It was an answer, at least, that the black lady filling out the form could believe in, and that has often made me think about how she needed a reason to trust me. Comprehension of her situation without a bridge was inconceivable to her. If you are dumb enough to believe that everyone gets what they deserve, then I can’t wait for you to get what you deserve. Of course, I know that it’s just as likely that you won’t. Does anyone understand this belief better than I do? Is there any explanation for people who resent their own lot in life but who are willing to point to the even more downtrodden and say they must deserve it? Is there any effective way to point out the delusion inherent in this line of thought? In my musings on the anniversary of Bloody Thursday, I wonder why so many want to strip away protections from others rather than extending them to more. I wonder why if they don’t feel they have what they deserve in terms of job security and working conditions, they think that others shouldn’t have it either. I wonder that those who have health insurance want it denied to anyone else, and I wonder even more at those without it who don’t want to be “forced” to share the financial consequences of their health risks. I wonder at working people’s susceptibility these days to being divided and conquered by the wealthiest of the wealthy, whose only interest is in maintaining their own power, their freedom to do to the rest of us what they will and to use us for their own ends, their freedom to take away ours. Freedom in this country at least theoretically means that people have the opportunities to pursue health and happiness. The growing income inequity impinges on that, as does a lack of basic healthcare provisions for all citizens. We need to make sure that we all have those opportunities, not just a select, self-appointed few. I think in the future, I will celebrate July 5 right along with July 4. They seem to me two sides to the same coin of freedom–freedom to rise a little bit as much as the freedom to accumulate vast wealth unimpeded. Posted in Politics & Current Events, Psychology, Uncategorized and tagged 1934 Maritime Strike, 1934 Waterfront Strike, Barack Obama, Bloody Thursday, freedom, ILA, ILWU, income inequity, Mitt Romney, NEA, opportunity, positive psychology, unions, wealth. Bookmark the permalink.